Knowledge-based systems are suitable for realizing advanced functions that require domain-specific expert knowledge, while knowledge representation languages and their supporting environments are essential for realizing such systems. Although Prolog is both useful and effective in this regard, the language interoperability with other implementation languages, such as Java, is often critical in practical application development. 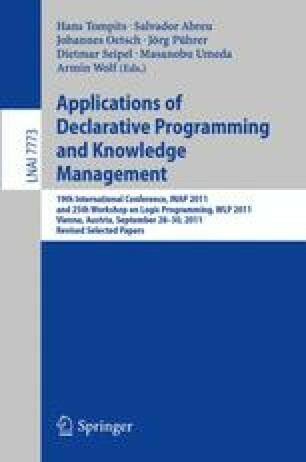 This paper describes the techniques for translating a knowledge representation language, a nondeterministic functional language based on attribute grammars, into Java. Translation is based on binarization and current techniques for Prolog to Java translation although the semantics are different from those of Prolog. A continuation unit is introduced to handle continuation efficiently, while variable and register management for backtracking is simplified by exploiting the single and unidirectional assignment features of variables. Experimental results for several benchmarks show that the code generated by the prototype translator is more than 25 times and 2 times faster than that of Prolog Cafe for nondeterministic programs and deterministic programs, respectively, and more than 2 times faster than B-Prolog for nondeterministic programs.